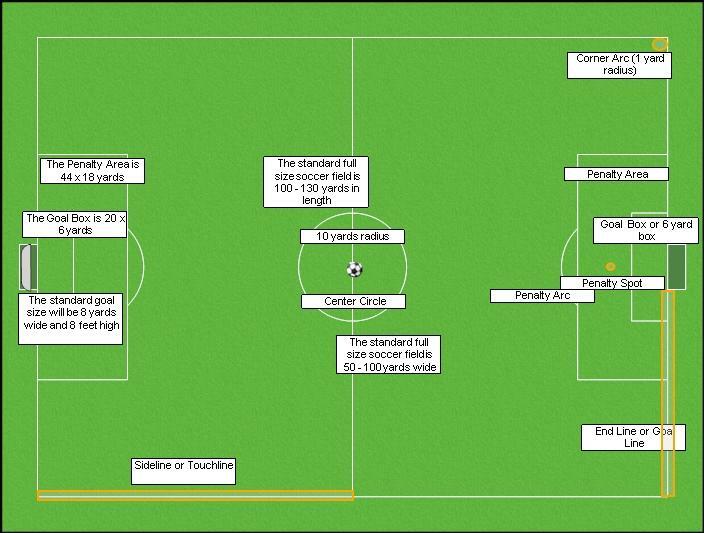 A full size soccer field is 50 – 100 yards in width and 100 – 130 yards in length . However, the size of the field is going to be very much dependent on your child’s age group. The center circle is where the game of soccer begins. The team kicking off is the only team that can have players within the center circle before the ball is kicked. The opposing team must remain outside of the center circle on their half of the field until the ball is kicked and makes one full revolution. The penalty area is where the goalie can touch the ball with his hands. Beyond the penalty area the goalie must follow the no hands rule. If a major foul is committed within the penalty area, the other team is awarded a penalty kick. If the ball makes one revolution over the sideline, the team not responsible for the ball going out of play gets to throw the ball into play. The player throwing the ball in, must use two hands and keep their feet on the ground. If the ball makes one revolution over the endline, one of two things happens and it depends on which team kicked the ball out of play. If the team defending that half of the field kicks the ball out on their own endline, the striking team gets to take a corner kick. If the team striking kicks the ball out on the defensive team’s endline, the defensive team gets to take a goal kick. Can anyone tell me the minimum distance from the field of play to existing structures or fencing. I am talking about frame and block facility building distance from field of play and chain link fencing with poles secured in ground by cement. How far back should parent/spectator distance be from field. This is for under 12 years of age play. Can you refer me to articles or organizations that establish this? This website have a lot of great content but I feel it has not been updated. Is this website for sale, I really am interested in soccer and love to keep it updated. Please let me know.